CADD Manager Home>CAD Management>Blog article:Decision Making – Bad Call! Decision Making – Bad Call! It may be in your favorite sporting event that this accusation is made. You yell it at the Umpire in baseball, the Referee in US football, or maybe the local official of your child’s chosen sporting event. 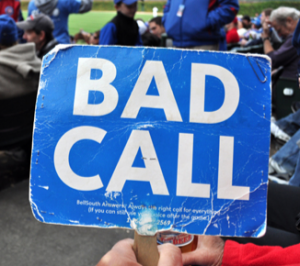 We are all subject to bad calls, not just sports officials. Thinking about the fast calls they need to make and how we over analyze them with slow motion and freeze frame cameras, I am amazed at how they get most of them right. Sure there are some that are wrong and some that change the outcome of an event, but most day in and day out calls are solid. Let’s give them some breathing room. What if someone was looking over your shoulder at work and ready to scream “Bad Call” after you make a decision on some project or initiative. It would be stressful to think of working under that kind of environment. Some of us may actually be working in those conditions. Each day you may go to work thinking that someone will overrule your decision as if they had freeze frame views of what you are doing. Your boss may change your choices and take over your projects. That would be a tough environment. We do make bad calls from time to time in our work and most firms and bosses are willing to forgive them as you learn from them. Employees who consistently make bad decisions soon find themselves without a position. Getting the right decision is key to making progress at your firm and in your career.